RECON, the premiere manufacturer of aftermarket lighting and accessories for the Truck and SUV market is proud to announce CLEAR & SMOKED LED 3rd BRAKE LIGHTS for every make and model of domestic pick-up truck & some SUVs & domestic performance cars. RECON LED 3rd brake lights are much safer, brighter, more intense, longer lasting, and better looking than their ordinary factory installed 3rd brake light counterparts. RECON CLEAR & SMOKED LED 3rd BRAKE LIGHTS take just seconds to install and are a direct replacement for your OEM factory installed 3rd brake lamp. RECON CLEAR & SMOKED LED 3rd BRAKE LIGHTS are made to exacting standards which exceed OEM specifications. 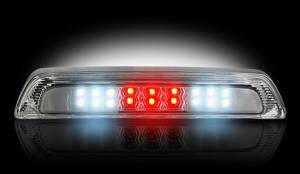 RECON CLEAR & SMOKED LED 3rd BRAKE LIGHTS are street legal in all 50 states and have been approved for use by the National Highway Traffic Safety Administration “(NHSTA”). RECON CLEAR & SMOKED LED 3rd BRAKE LIGHTS are available with either Clear or Smoked lenses. Each kit comes complete for simple installation. All RECON LED 3rd Brake Lights are Direct Plug-N-Play Replacements. No tools other than a screwdriver are required. In most cases installation can be completed in under 60 seconds! Features Include: · Highly visible from other vehicles thus reducing chances of rear end collisions · Made using only the finest state of the art components & circuitry · RECON LED aka L.E.D. lights last tens of thousands of hours · No annoying flicker from halogen or fluorescent bulbs · L.E.D. lighting is impervious to heat, cold, shock & vibration · No breakable glass is used, & L.E.D. Third Brake Lights are completely waterproof · RECON retail-friendly packaging makes for a perfect gift · Great looking Clear or Smoked lenses for a Chrome or Dark Smoke "Murdered Out" Look · Super Bright high-intensity L.E.D. lights will outlast your truck, SUV, or performance car · Uses existing holes without modification or drilling RECON LED 3rd Brake Lights are Available in the Following Applications: Dodge RAM 1500/2500/3500 - 1994 thru 2013 Chevy/GMC Silverado & Sierra - 1994 thru 2013 Ford F150 - 1997 thru 2013 Ford Raptor F150 - 2010 thru 2013 Ford F250/F350/F450/F550 - 1999 thru 2013 Ford Ranger - 1993 thru 2003 Ford Excursion - 2000 thru 2004 Chevy & GMC Tahoe, Yukon, Suburban, Denali - 2000 thru 2006 Ford Mustang 2005 thru 2009 Toyota Tundra 2007 thru 2013 Get Lit with a RECON LED 3rd Brake Light Today!! !